Some films get stuck in a director's teeth, and it takes him a while to get it out. This results in multiple cuts of the same films, seemingly endless revisions of the kind that film fans will argue over and study. John Cassevetes and Killing of a Chinese Bookie, Oliver Stone and Alexander, and even Francis Ford Coppola on Apocalypse Now and to a lesser extent Ridley Scott with Blade Runner--these are movies that, for a variety of reasons, did not arrive on the screen as intended the first time around, causing the directors to continue tinkering with them until he or she gets it right. 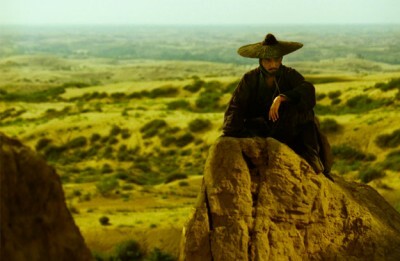 So it was with Wong Kar-Wai's 1994 film, Ashes of Time. It's a movie that, since its initial box office and critical failure, has gained a cult reputation but has never really had a proper airing due to a lack of decent film prints available, woefully substandard DVDs, and even rumored rights issues. That Ashes of Time has found an audience at all in the intervening years is a miracle, since the notoriously confusing structure doesn't need any further obfuscation from murky transfers and bad subtitles. In its original form, it requires multiple viewings to sort out what is happening, which was a major contributor to the Chinese audience rejecting the film when it was released, even despite featuring some of the biggest stars of Hong Kong cinema, including Leslie Cheung and Brigitte Lin. Fourteen years later, Wong Kar-Wai has returned to the editing bay for Ashes of Time Redux, restoring and reconstructing his martial arts epic so audiences can finally see it as it was originally intended and with some of the obscuring cobwebs swept away. Loosely based on the popular adventure novels of Louis Cha, Ashes of Time was dressed in the trappings of the wuxia (swordplay) genre but willfully subverted all of that genre's conventions to expose the heavier emotions underneath. For fans of traditional martial arts films, Ashes of Time was a little like the cinematic equivalent of Charlie Parker doing an album comprised entirely of Beatles covers. The melodies may be familiar, but how it comes out of the master's saxophone would likely sound more like Bird than it does the Fab Four. Those expecting the usual mawkish rendition of "Yesterday" will be sorely disappointed. Though, now that I think of it, Paul McCartney's classic ballad isn't all that thematically dissimilar to Ashes of Time. Wong's movie uses the action setting to ruminate on how the passage of time and the tricks of memory amplify feelings of loss, loneliness, and regret. All of the characters yearn for a love that has slipped through their fingers, and the lingering pain refuses to release them to carry on with their lives. It's a regular concern of Wong Kar-Wai, and all of his movies are constructed along a fluid, bending timeline where past, present, and future all exist at once. The unshakable grip of yesterday makes today unbearable and makes one think that tomorrow will never come, even as almost all of his movies are paradoxically narrated in the past tense from an indistinct time far beyond what we are seeing. 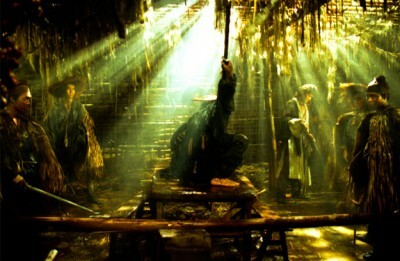 Surprisingly, one of the few trims that Wong makes in Ashes of Time Redux is to remove part of Leslie Cheung's opening monologue where he refers to "many years from now," which serves to dial down some of the fatalistic overtones that pervade the older cut, delaying our realization that all of these characters have an inevitable end awaiting them. The late Leslie Cheung is marvelous as the melancholy swordsman Ouyang Feng. While he once desired to be a famous hero, a failed romance has caused Ouyang to renounce his blade and retreat to a vast desert, its barren landscape a reflection of his desolate soul. Ouyang now acts as a go-between to hire other swordsmen for assassinations. Unlike most wuxia heroes, honor holds no sway for him, he only acts when there is financial reward. Over the course of Ashes of Time Redux, various swordsmen and clients pass through his tiny inn. These include three warriors, all of whom share some connection either to each other or as some facet of Ouyang's personality. Huang Yaoshi (Tony Leung Ka Fai, The Lover) is a scoundrel who never follows through with the love he inspires in others and is thus doomed not to have the love he truly desires. Having jilted the beautiful Princess Murong Yin, her brother, Murong Yang, tries to hire Ouyang to kill Huang as vengeance; on the flipside, Yin tries to double-cross him and have Ouyang kill Yang--an assignment Ouyang realizes is impossible, since both brother and sister are the same fractured person (both played by Brigitte Lin). Huang has also jilted the wife of his best friend, the blind swordsman (Tony Leung Chiu Wai, 2046 and Infernal Affairs), who comes to Ouyang to earn money so he can return to his wife and see her again before his eyesight completely fails him. The final component of this foursome (which has some connection to the major directions on the compass) is Hong Qi (Jacky Cheung, As Tears Go By), a fighter of ignoble background but of noble aspirations. Desiring fame as a hero, working with Ouyang ends up tainting him, to the point where he ends up going against the death dealer's wishes and helping a young girl (Charlie Yeung, Fallen Angels, Bangkok Dangerous) who can only afford to pay him with eggs, not money. In many ways, Hong Qi is meant to be Ouyang's total opposite, their fates intertwined by how they are defined against one another, the push and pull of magnetic attraction. Hong Qi has a wife (Li Bai) and a purpose, two things Ouyang lacks. All four of the swordsmen have something that one of the others wants, usually the love of a woman who is too busy pining for one of the other men to see the man pining for her. The Blind Swordsman's wife (Carina Lau, Days of Being Wild, Flowers of Shanghai) loves Huang instead of her husband, while Huang loves Ouyang's lost love (Maggie Cheung, Clean), who still dreams of Ouyang despite having married his brother. Characters often mistake the men for one another, and the audience is meant to do the same, as they are all versions of the same broken male archetype, making them even more conflicted than Murong Yin/Yang. Even their names sound similar to one another. I'm over a thousand words into this review and I've only begun to unravel a couple of the many threads that make up this complex narrative tapestry. I could go on for pages writing about the virtues and the deeper meaning of Ashes of Time, but that would likely begin to bore those who have yet to see the film and also rob you of the experience of discovering all of this for yourself. For those who have seen the film in its previous incarnation, however, you are probably wondering what makes Ashes of Time Redux so different. The answer, surprisingly, is very little. The one major cut is the opening battle sequence between Huang Yaoshi and the bandits, which I have to admit surprises me, since it means Huang is no longer as directly responsible for the violence that eventually touches the others as he is responsible in causing so much romantic strife. Similarly, the final montage of the warriors in battle is gone, which is no great loss, though it did emphasize more how entangled with one another they all were. The rest of the trims are short bits of narrative exposition like the one about Ouyang's future that I noted above, which serves to erase more of the connection to Louis Cha's source novel (the literal translations of the martial arts nicknames are now gone) and create the illusion of a more linear timeline. The latter element is aided by interstitial title cards demarcating the changes in season between the movie's major chapters. Having watched my old Hong Kong DVD the night before seeing Redux, I'm amazed how such little things make such a big difference, but by altering less than a minute of film time, Wong Kar-Wai has completely changed the whole film. The Redux fight scenes between the Blind Swordsmen, Hong Qi, and the bandits are also a lot easier to follow. The editing seemed less chopped up with indecipherable close-ups--though, to be honest, without being able to compare the versions side by side, I am not sure if this is really a matter of the scenes being recut or just the benefit of the cleaned-up picture. This new print of the film is a revelation. Being able to see Ashes of Time in all of its clear, colorful glory for the first time made me feel like I had never seen the movie at all before. Christopher Doyle's remarkable photography no longer looks muted or hazy, and gone are so many dark shadows that blotted out some of the incredible detail of the costumes and the set designs. In addition to restoring the picture, Wong Kar-Wai has also done a top-to-bottom audio clean-up, and for English speaking audiences, this also means our first time being able to read quality subtitles. All of the prints of Ashes of Time I have seen, including an actual film print I saw in a theatre, featured burned-in dual English and Mandarin subtitles, and the literal English translation all but obliterated the poetic nuance of the dialogue. Part of being able to understand Redux better simply comes from having subtitles that make sense. Gone, too, are the cornball sound effects that made the swordfights sound chaotic and laughable and the overbearing musical score that tried to marry Vangelis-esque synthesizers with gritty Morricone-style strings. The refurbished musical track by Frankie Chan and Roel A. García, complete with new cello solos by Yo-Yo Ma, plays up the more traditional Chinese elements while also enhancing the bits Wong Kar-Wai borrowed from westerns by Sergio Leone and John Ford. Second chances can be marvelous things, and in the case of Ashes of Time Redux, Wong Kar-Wai makes the most of it. The time that has passed and the movies he has made in between--this was only his third feature--has given him perspective and honed his skills in such a way that the writer/director could see places where his martial arts masterpiece didn't quite work, resulting in a smart restoration rather than a radical remodel. Ashes of Time Redux is still a challenging film, full of interweaving story lines and intentionally ambiguous motivations, but by smoothing out some edges and remastering the audio and visual, the movie finally gets out of its own way to let the audience get at all of the wonderful things it contains. Buy tickets to "Ashes of Time Redux" now!